Aloha Exchange Club President Winston Churchill, left, and Program Director Joey Estrella pose with ‘Officer of the Month’ James Correa. 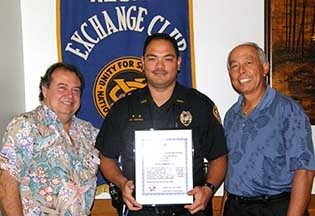 The Aloha Exchange Club of East Hawaii recognized Hilo Patrol Officer James Correa as “Officer of the Month” for May. Correa was recognized for solving two robberies that were reported within an hour of each other in Downtown Hilo the night of May 10. Two juvenile males approached a 31-year-old man, hit him and took his wallet. The victim was taken to the hospital for a laceration above the eye. An hour later two juveniles approached a 53-year-old man and demanded money. When the victim refused to give them any, the juveniles pushed him to the ground, punched him, searched his pockets and stole an umbrella. The second victim was not seriously injured. Correa, who was training a recruit, used his contacts in the community to help him identify the juveniles, find the stolen umbrella and arrest a 15-year-old boy and a 16-year-old boy for robbery, curfew violation and a drug charge. Captain Richard Miyamoto, who was Correa’s acting lieutenant on the night of the robberies, nominated the officer for the honor. He said it was Correa’s “determination and dedication” that resulted in the solved crimes. He noted that Correa taught his investigative skills to the officer he was training.